In Indian weddings, a lot of attention is given to the outfits for the wedding couple. The Sari or lehenga is the standard and popular wedding attire for the bride. However in various parts of India, in weddings of different communities, the traditional styles and colours of the sari may vary. 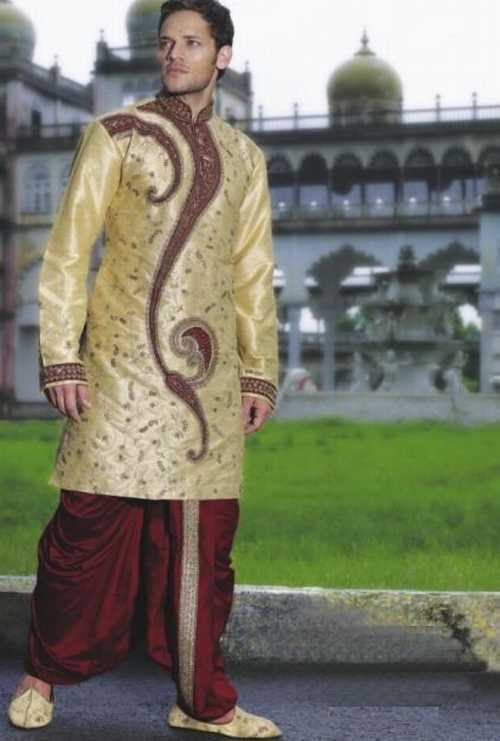 Different designs for the groom may be sherwanis, pathan suits and dhoti-kurta. India is the hub of wedding attires with garment shops teeming in major cities. The shops are mostly run by experienced garment makers and businessmen. The ethnic garments business in India is very old and finding the ethnic authenticity is very easy. • Plan in advance - As you go shopping for the dress you have in mind, you will come across many designs that you will like more than the others. Going around shopping in India will load you with options to choose the perfect outfit from. Just don’t buy anything and everything you like. Try the dress first. • The perfect fit - After selecting the attire make sure you have enough time for two to three trials. For the bride it is advised that she does not wear make up to the trials so as to not leave any chances of letting it come onto the dress. During the trials, it is advised you take a friend who will give an honest opinion on the look of the outfit on you. • Options - You may have liked a wedding outfit that you saw in a magazine or a website. You can take a picture of that to the shops for convenience. The shop staff may also advise you something that suits you better than what you have in mind. Do not have a bias. Keeping your mind open to various options can fetch you something better. • Custom made outfit - You may go for a custom made outfit which may be from a designer. Ensure enough time before the wedding to avoid hurry for which the quality of tailoring can suffer. Make sure that you get to see the sketches/pictures of how the dress will look like. Reputed tailors can advise you the best suiting outfit which can make your guests go "wow"! • Accessories - To complete your outfit, you may choose a watch and footwear that goes with your clothing. It is advisable to keep the color combination attractive. Go for a pair of shoes that goes with the ethnicity of your clothing and keeps you comfortable throughout the wedding day. A dream outfit for the wedding day can make the couple the most attractive and talked about element of the day. Traditionally, the style of clothing you will wear depends on which Indian region you belong to, and the shopping will be best undertaken in that part of India. However, for a themed or a modernized wedding, custom made outfits are more prevalent. It is also advised that you do not avoid using a second-hand outfit if it is still in good condition, matching your dream deal.